I can still detect the faint scents of bleach and soap on my hands as I sit down to write about the unforgettable events of this day. In the past few months, I’ve seen starving children and dirty hospital floors. I’ve tasted rice every single day. I’ve felt my head pounding and stomach clenching from malaria-induced fevers. I’ve heard French greetings, babies crying, and roosters crowing at 4:00 a.m. But of all the senses, today it was the smells that most captured my attention. I can still detect the faint scents of bleach and soap on my hands as I sit down to write about the unforgettable events of this day. I don’t recall her name. It might have been in the local language. What I do remember is how terribly thin and old she looked. Cataracts had nearly blinded her eyes, and she could barely walk. She used to visit my missionary mom, Tammy Parker, to ask for food. But she hadn’t come in a while, and today Tammy felt inspired to go see her. She asked if I and her daughter, Brichelle, wanted to join her, and we jumped at the opportunity . . . until we entered the woman’s hut. The rank smell of urine burned my nostrils. Trash from months, if not years, littered the floor. The water in her pot was fetid. Her mosquito nets were filthy. And her bed consisted of sticks, a straw mat, and a soiled blanket. The place wasn’t fit for an animal. 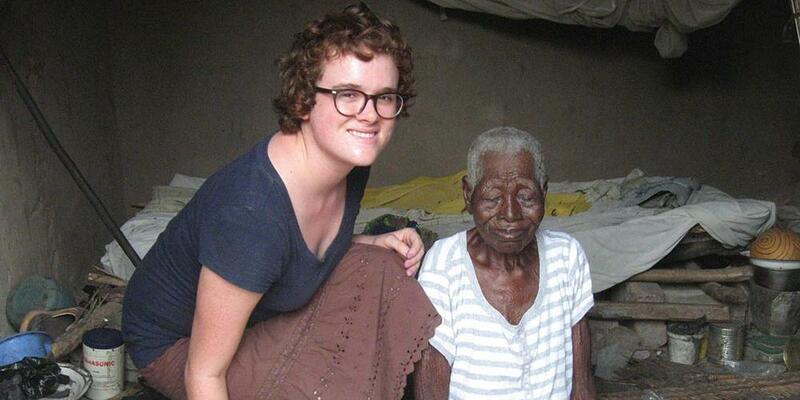 This culture generally respects and cares for its elders, but this woman had been utterly forgotten. Sure, she had a hut within her family compound, but they didn’t bother feeding her, washing her or her clothes, or helping her to move around. Tammy and our translator, Naomi, helped the woman get up from her bed and shuffle to a straw mat under a tree. As soon as they had her outside, we started taking everything else out too. We disassembled the bed and moved the water pot, mosquito nets, and trash. Then Naomi swept the floor, creating a mini dust storm. Next Brichelle and I cleaned the mosquito nets. Over and over we drew water from a well with a gasoline container tied to a rope. My back ached, but it was the first time I had felt so alive since I’d been here. We soaked the nets in buckets of water with a small amount of bleach. Then we rinsed them again and again until the water didn’t turn brown. Finally, we scrubbed them with a big block of soap until they were almost white again. We did the same for her blanket and clothes. Naomi cleaned the cement floor with bleach water and then carefully reassembled the bed, adding a clean sheet and pillow. We filled her disinfected pot with fresh water and retied the mosquito nets. Now that the hut had a semblance of order, Naomi gently bathed the woman and helped dress her in a skirt and top that Tammy had brought. Clean and fresh, the elderly woman shuffled back to her hut. Then, as she lay on the crisp white sheet, she began whispering a blessing for us, praying that God would always watch over us and give us a good life. How could this woman, who had almost nothing, pray for God to bless us? I have everything that I need, while she didn’t even have companionship or someone to love her. Yet she was so grateful for what we had done that she tried to bless us with the very things she did not possess. Tears were sliding down her wrinkled brown face, and I choked back tears of my own. I had been part of something so much bigger than myself today. I thought I was going to be a blessing. Instead, I was the one who was blessed. Originally from Tennessee, Jordan Arellano volunteered as a teacher at the Hospital Adventiste de Bere in Chad. She recently graduated from Andrews University in Berrien Springs, Michigan, with a bachelor’s degree in English.